We spent two nights in the campground in Tarifa, Spain getting cleaned up and then headed east along the Mediterranean coast and turned north into the province of Alicante. 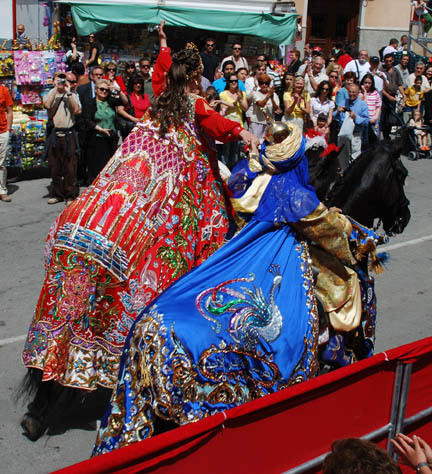 We are headed to a Moros and Christianos festival in Caravaca. The Moors (Moros, Muslims from Africa) ruled the area from the mid 700's. At their peak they controlled Spain, Portugal and part of France until the last were pushed back into Africa in 1492 by Ferdinand and Isabella (the same who financed Christopher Columbus that year). We spent only one day at the festival and watched the children's parade and then wandered the town. First were the Moors, lots of them. There seemed to be clubs (possibly neighborhoods?) 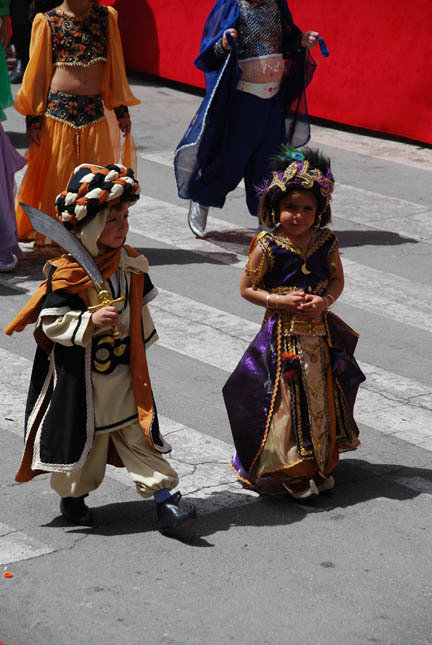 that marched as a group dressed in the finest Moorish clothing that their imagination could devise. Each group of children had a band following them and various adults to keep control. 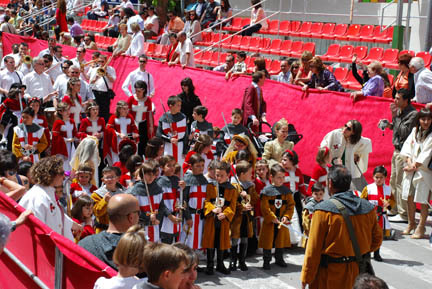 The Christians came next and in the same pattern, groups of costumed children followed by bands. I guess these are Knights Templar judging by their costumes. The Moors and the Christians each had a horse team in the middle of their section of the parade. The horses were ridden by a boy and a girl about 13 or 14 years old. And all were skilled horse riders. They raced up and down the street and showed off their fine dress and horsemanship. This is the Moorish couple. The embroidery was very fine and the patterns sparkled in the sun. Next was Alicante and spending the night with Ernst and Ann. We had met them in Fez and again in Tarifa. They had been with a convoy of German speaking travelers in Morocco. They had been there for three an a half weeks. They invited us to spend the night with them when we passed thru their area. They are from Switzerland and have a nice house in Spain that they spend the winters in. Ann fixed delicious spaghetti for dinner and we talked until late. The next day we headed to Barcelona and an English bookstore called Elephants. It has lots and lots of used paperback books at good prices. We traded in the ones we had read and bought a bunch more. (We carry about 30 novels to read with us. Both Kathy and I are voracious readers and this is a major expense in our lives.) We heartily recommend Elephants for good value and good selection. 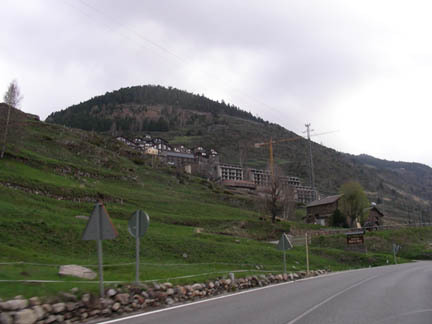 Then we headed to Andorra, a separate tiny country between Spain and France hidden in the Pyrenees Mountains. It is best known for it tax-free shopping and skiing. We traveled up a narrow valley with the towns crowding the bottom and creeping up the sides. We think that about half of the country is under construction, either roads, hotels or shopping centers. (You can see two cranes building new hotels on the hillside in the picture.) We bought me some new motorcycle boots (the ones I bought in March had the zippers giving out already) and six 1-liter bottles of Famous Grouse Scotch. The scotch was 9.80 Euros a bottle (about 15 dollars a liter, at home it costs 25 dollars for 3/4 of a liter!). This is our stock for Scandinavia where liquor is supposed to be very expensive. Because the roads and towns are crowded in the very narrow valley it is difficult to drive there, the roads twist between the buildings that were built along the old mule trails hundreds of years ago. Some newer roads are being built but they are only two lanes also and cut into the hillsides going around the towns. Then we went over the pass (almost 8,000 feet high and COLD!) and entered France. The customs agent wanted to know what we bought and we told him about the boots but somehow "forgot" about the scotch (we're not going to drink it in France anyway). He was only interested in cigarettes or liquor that had been purchased in Andorra and sent us on our way. We're now headed into the Cathar region of France.